Australians are attending more live events than ever before. In the past year, 91% of Australian Millennials (aged 18-34) attended a live event, ranging from entertainment-focused experiences like music concerts and beer festivals, to more cause-related events like marches and rallies. Our increased preference for live experiences is being driven by a strong desire to connect with people, our communities, and the world — and there’s no doubt that the current social climate is contributing to this uptick. A recent global poll revealed that when Australians consider the future of our country, they say that two things are essential to promoting positive change: Connecting with one another in real life, and the resulting expansion of perspective. Download the full report to learn more about ‘The Experience Movement’ and how Millennials are driving the demand for experiences over ownership of possessions. 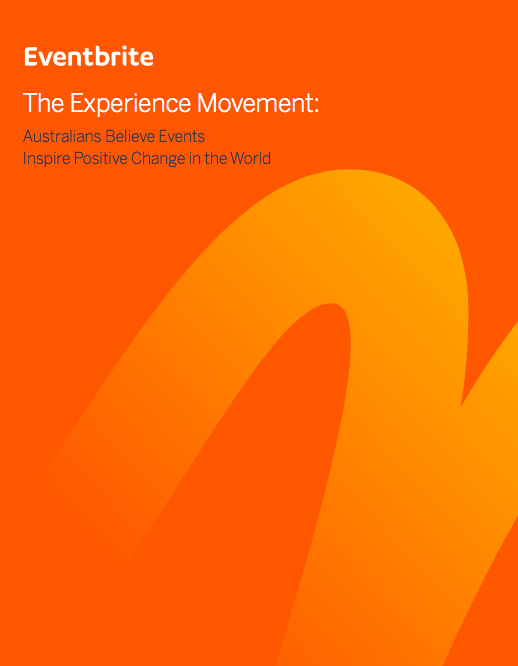 90% of Australians believe it’s essential for people to come together in person to promote positive change — regardless of age, gender, income, or geography — and 1 in 4 Australians attended an event supporting a particular cause within the last year. More than three quarters (83%) of Australians agree that attending live events makes them feel more connected to other people, the community, and the world — higher than any other country surveyed including the US and UK. Connecting with people offline expands perspective and creates real impact in a way that online interactions can’t. 80% of Australian men and women agree that attending a live event has been more successful at expanding their perspective than just reading about a topic online. But interestingly, an event doesn’t have to be “political” to inspire positive change: 90% of people believe that all types of live events can inspire positive change for the country. Often referred to as the “experiences generation,” Millennials (ages 18- 34) now represent one-third of the national population, and continue to be the driving force behind the growing attendance at a diverse range of live events. This generation looks to live experiences for solidarity and as a form of expression; 9 out of 10 Millennials (91%) have attended at least one live event within the past 12 months. To continue reading the report, please enter your details in the form to the right and a free copy will be delivered to your inbox.